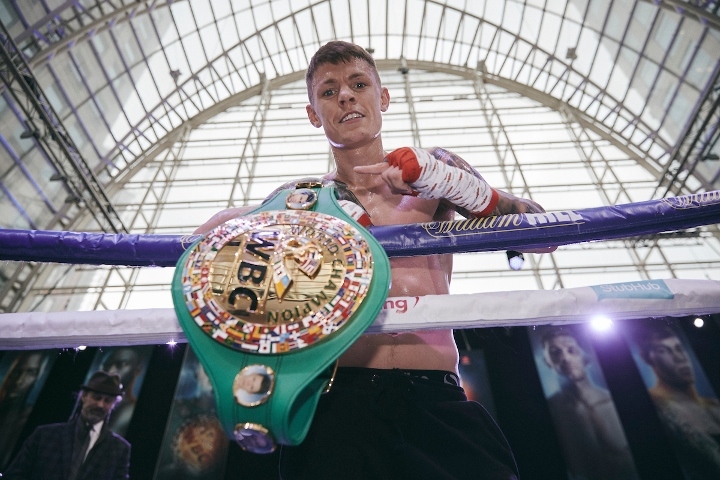 Copper Box Arena, London - Making the first defense of his WBC flyweight world title, Charlie Edwards (15-1, 6 KOs) easily outboxed Angel Moreno (19-3-2, 6 KOs) over twelve one-sided rounds of action. All three of the official judges saw it 120-107. Edwards captured the title back in December with a twelve round decision win over Cristofer Rosales. Edwards has not lost since a TKO defeat at the hands of Johnreil Casimero back in September of 2016. Moreno was riding an unbeaten streak of nine fights as he entered the ring. Moreno was having issues right from the start, with Edwards outboxing him and landing accurate punches in the first round. Moreno was pushing forward and trying to bait Edwards into a brawl. Mostly showboating from Moreno in the second, as Edwards continued to box his ears off. Edwards was landing sharp punches in the third and it was practically target practice. Moreno continued to come forward and was throwing wild swings. Edwards was moving and countering from bell to bell. In the fourth, Edwards was playing with Moreno. He was now showboating and picking his punches on Moreno. By the sixth, it was one-way action, but Moreno was not really bothered by the punches that were landing. Edwards was moving often in the eight as Moreno was chasing after him like a bull. Moreno suffered a flash knockdown while going after Edwards. In the ninth, Moreno was now trapping Edwards against the ropes and had some moments with combinations. Edwards for the most part was still in full control. It was more of the same for the remainder of the contest, with Edwards outboxing Moreno with ease. Edwards is world class. Yafai won't excite and if he wants a pay day, it will be in the US. Could Román González come back down?